Tuberose (Polianthes tuberosa) is an old-fashioned garden plant with an extremely potent fragrance. Originally from Mexico, it has been cultivated for centuries as a cut flower, as well as for the perfume industry. Tuberose is related to agave plants and has thin wispy leaves that are reminiscent of its cousins in the arid regions of the southwestern U.S. and Mexico. The stems rise three feet from the ground in late summer and unfold a series of two-inch tubular white flowers one by one over the course of many weeks. Tuberose grows from an elongated tuber which is hardy in USDA zones 8 to 10, but the tubers can be dug up and overwintered indoors in colder climates. Tuberose is a good choice for a cut flower garden along with plants like lisianthus and Shasta daisies. It is suitable for perennial borders and cottage gardens as well as in pots and planters on a patio or deck. Massing them in a large field is another option, but be prepared to be overpowered by the fragrance. 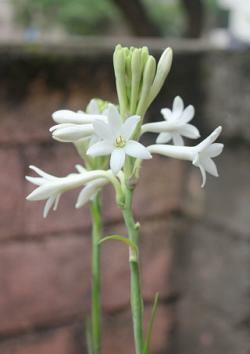 Plant tuberose in full sun in a bed of rich, well-drained soil. It is a heat-loving plant, so in northern areas or cool coastal climates it it best planted against a south-facing wall for extra warmth. The tubers should be planted on their side about three inches deep and spaced eight to 10 inches apart. Tuberoses require regular water, but it is best to let the soil dry between waterings. Irrigating once per week if there has been no rain is usually sufficient. Fertilize tuberose monthly during the growing season with a balanced all-purpose fertilizer, such as 10-10-10. Allow the foliage to remain on the plant after the flowers have faded so they can continue to photosynthesize and store energy in the roots for the following season. When the leaves turn yellow, clip the stalks at the base. In cold winter climates, dig up the tubers after the stalks have faded in fall, allow them to dry for a few days and then store in a box of slightly moist sand or sawdust. Every few years, dig up and divide the tubers to keep them from becoming overly crowded, replanting the largest tubers at a 10-inch spacing. 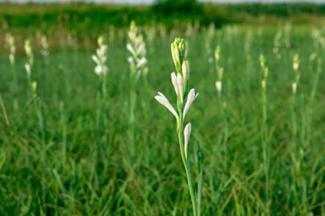 Tuberose is virtually never bothered by pests and disease. 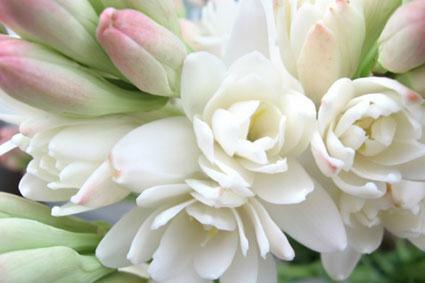 Tuberose is not widely available in nurseries, but can be found at many mail order suppliers. 'Mexican' is a common heirloom variety with single white flowers. 'Double Pearl' is a double white-flowered hybrid form with a touch of pink on the flower buds. 'Yellow Baby' has lemon yellow flowers on dwarf plants just 10 inches tall. If you're a fan of fragrant flowers, tuberose will win you right over. Few plants possess such sweet, pure and powerful fragrance -- plant a few tubers and surprise your horticultural friends with this nearly forgotten gem.